Back in the 60's they used to advertise a 6" F/10 Vernonscope refractor. (name was Surveyor) I believe they sold for about $700 (way, way out of my price range at that time) I wonder if there is anyone here who ever owned or used one. I never saw any reviews or news about the performance of this model. I too have been interested in the history of this scope, there is a picture in Henry Paul's Telescopes for Skygazing. The mount looks like an Edmund or Jaegers. I asked Don Yeier about these scopes at the RTMC a few years ago and I believe he said they were made for institutional use. 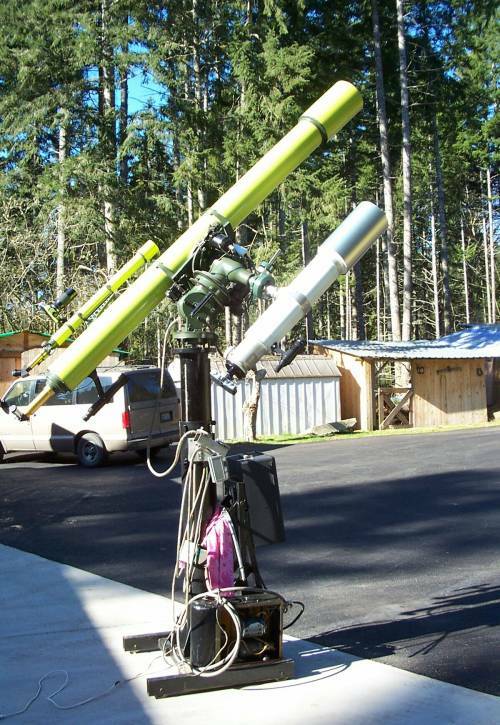 I believe they were F10, it certainly was an impressive telescope. I recollect Don saying they had originally built one or more for a college under contract. However, it must have occured to them to tap the high end amateur market. I wonder how many were sold to amateurs? I have never seen one on the used market. There is a 6" f/15 designed and built by Chester Brandon in the 1950's still in use (and open to the public) at FOX OBSERVATORY near Ft. Lauderdale, FL. 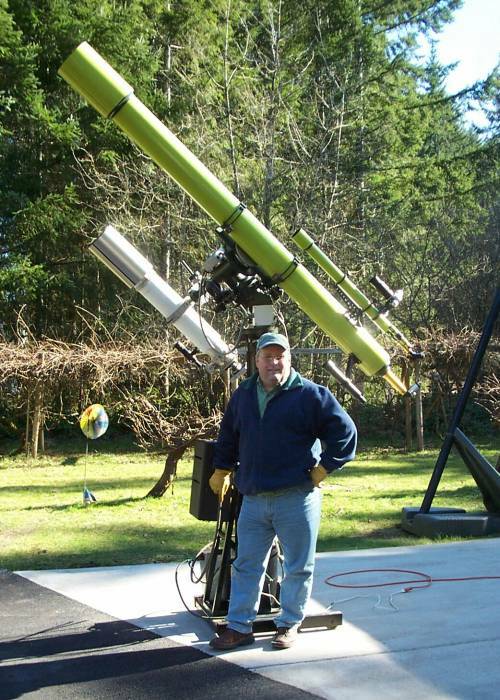 Mr.Brandon, of course, later sold all of his designs for both scopes and eyepieces to Vernonscope. It's been nearly thirty years since I last used this scope but I recall it being a wonderful performer (the first time I ever saw Sirius "B" was with this scope in the mid-70's). This was, however, prior to my owning and becoming familiar with numerous fine refractors...including AP's, Takahashis, Alvan Clark's and TeleVues. I wonder how I'd rate the old Brandon now? I think a trip down to Ft. Lauderdale to find out is in order! I found an ad for the VERNONscope 6" f/10 Surveyor refractor in the December, 1964, issue of Sky & Telescope. 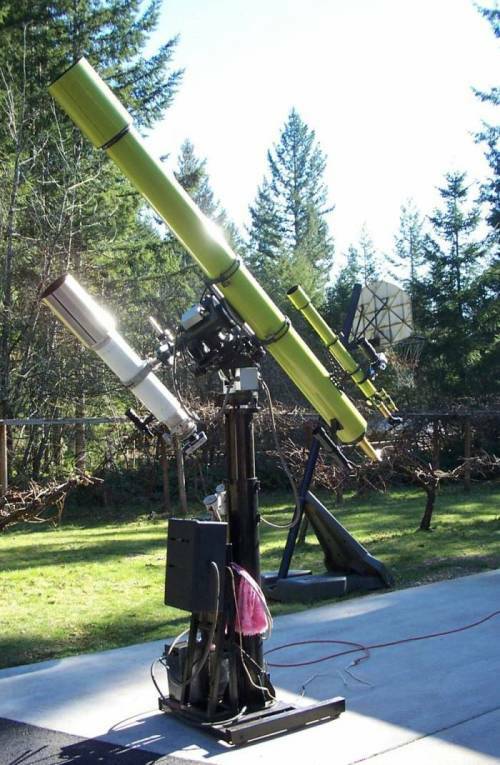 It looks like a poster child for "undermounted telescopes" - a real shakemaster mount. Don had at least one of these sitting in his shop for years. He still does, for all I know. I haven't been through Candor in a while. 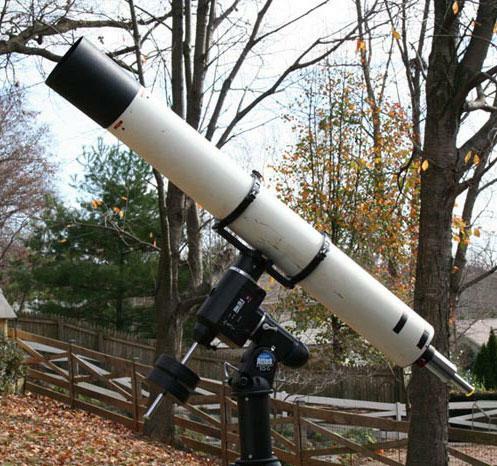 The scope certainly looked awesome to me when I was a kid. Yup, I saw an ad in one of my '65 S&Ts. Undermounted, perhaps, but I wouldn't mind fighting with it. I'll make a call this weekend and see if the one in the shop is still there. The 6" is gone from the Vernonscope shop. Drooling over 6" refractors again, deja vue anyone? Here is a pic, without my dead beat self in the way. I and my father built the green scope and the head-n-hydraulic pier. I built the white 6"f/6.5 astrograph. Imaging scope fer all you imaging folks. color of the big refractor. When building it, the decision to paint it green came when noticing all the other scopes on the field were either black or white. It was thought that something was needed to make it different(Not to mention its size, and uniqueness). Plus who wants to be like the other guy. I followed the old CNC TMB feel with the smaller white 6". The aluminum dew cap balanced it out. I think. If you're ever in my neck of the woods you're welcome at my EP. Hello. I recently picked one of these up from HandsOn Optics. Gary had it listed on his "fun list" as a "6-inch Brandon/Jaegers refractor." He said he bought it at the Stellafane swap meet together with an Edmund mount. He was selling the OTA alone. I've attached an image of it riding on my Atlas EQ-G. Although the paint finish has seen better days, the glass is in excellent shape. The pale purple Jaegers coatings are completely intact and there's not a scratch or blemish on the glass that I can detect. The OTA is very basic and utilitarian, without metal collars at the end of the tube or any indication of the make of the scope, except for the distinctive Jaegers focuser with red knobs. However, a comparison to the Vernonscope & Co. ad in the Dec 1964 issue of Sky & telescope confirms that it is the Surveyor. The black dew shield in the photo is a flexible astrozap-- not the original. I count three baffles. A very preliminary star test with a green filter shows good spherical correction and good collimation. My initial impression is that the color correction is comparable to a Meade AR-5. Can't compare it to a Chinese 6-inch as I haven't looked through any. I'm curious as to the history of this specific OTA. The fact that the previous owner had it on an Edmund mount suggests that it was sold to an individual rather than an institution, but not necessarily. If anyone out there is a previous owner of this OTA, I'd like to hear from you! Thanks, Keith. I'm very pleased with it thus far. I did some additional green filter testing tonight with the OTA fully cooled and it confirmed that the spherical correction is pretty good with no astigmatism. The color is there on bright stars, but my "soft touch " Sirius MV-20 filter controls it well enough. Can't wait to aim it at Saturn.